Since joining the Wildwood Path as an apprentice, I look forward to each month’s emailed overview as much as I looked forward to opening my Christmas stocking as a child. 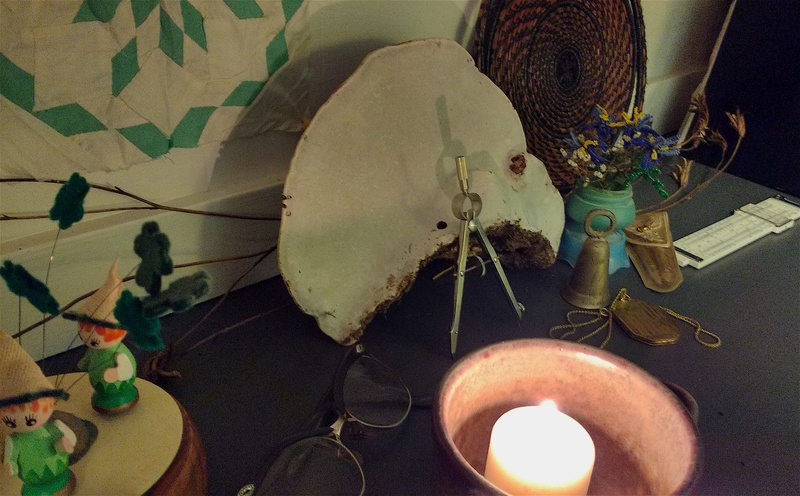 This month’s invitation beckons: Join us as we build our relationships with the mysterious worlds: the ancestors, the fire, our own grief, and our capacity for transformation. to see them all aglow. The lengthening nights as we approach winter solstice make me want to stay home from work, cozy up to a fire, read, knit, bake, write letters, call my grandma, look at family photos. I have such strong and wonderful memories of December traditions as a child–a whole month of arranging and rearranging the creche, putting ornaments on the Advent tree, decorating the house, lighting the Advent candles and singing, making cards and presents and cookies and secret plans to surprise friends and family. On Christmas Eve, my family would often attend the late church service, and I never failed to cry as the dark sanctuary slowly brightened as one candle lit two, and two lit four, until every person held a point of light, and the singing began. But what to do with these cherished traditions as an adult, living far from my family and not actually identifying with the specific religious elements of Advent and Christmas? How can I continue to celebrate the cycle of the seasons, the darkening and then lightening of the days, slowing down my own life in order to do things for my friends and family, appreciating the magic of fire? The song that runs through my head all through December is the song that my family sang around the Advent wreath. Every night my sister or I would light the candles, including one more with each passing Sunday. Purple, purple, rose, purple, and on Christmas: white. It was powerful, and reassuring, to perform this ceremony every year at this time. But as an adult, I can’t bring myself to set up an Advent wreath for myself and sing the song. I’m not Christian; it feels kind of hollow. I wasn’t Christian as a kid, either, but somehow it mattered less—what mattered was that we had a tradition. This year, I’m reclaiming the advent song and making it my own. Instead of anticipating Christ’s birth, I wrap myself in the warmth and love of my ancestors and contemplate the closeness of death, germination and birth. It’s hard for me to think about creating traditions for myself, because somehow they don’t feel as “real” as the ones that were taught to me by someone else. This is a new tradition that I’m creating, and one that will possibly only ever be observed by me, and I’m trying to value it for what it is. This is the song I’m singing for my ancestors. each death a kind of birth. This is my small start. it is our savior’s birth.